My amá (mom) served these powdered shrimp cakes regularly during Lent, especially on Good Friday because we were following the Catholic practice of doing penance by not eating meat. We rarely had meat at our table, so the penance part of this was always a disconnect with me. I loved eating them. The Spanish Catholic religion supplanted much of native American spirituality, but in these little cakes, I see the indigenous ways still inspiring toward beauty, oneness and hospitality. How did the indigenous communities negotiate the diminishment of our ancestral religion? How did we keep the original inspiration alive and functioning? How did our Catholic religion change and grow? What lessons can be learned about religious encounter? These are just little powdered cakes, but to me they bring up these large, ongoing questions. Using mortars for crushing, pounding and grinding, to make powders, is a culinary tradition with ancient roots. 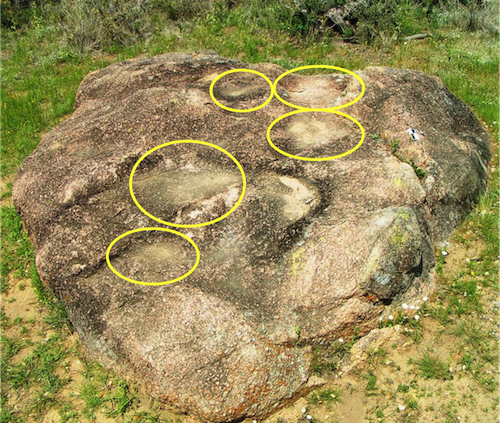 Archaeologists have found mortars all across Texas. At Enchanted Rock, archaeologists have uncovered evidence showing that human habitation at this spectacular rock mountain can be traced back at least 10,000 years. 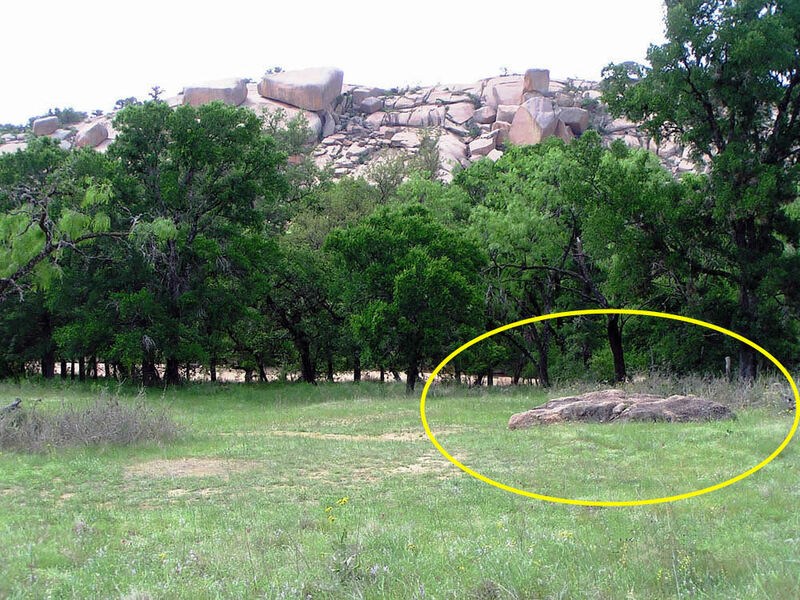 The five mortars in this granite bench, at the foot of Enchanted Rock were used for grinding and puréeing. So, stone-ground, powdered dried seafood? Of course! 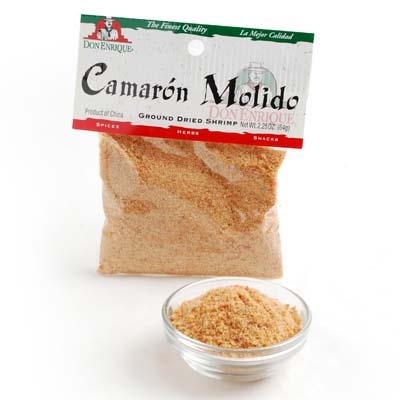 You can buy powdered shrimp at any grocery store in Mexican American neighborhoods, or online. Powdered shrimp does not require refrigeration so a bag of it is easy to store. It was in our kitchen often during Lent. The dried shrimp flavor is quite present, so make sure that the little cakes soak up the tomato sauce that softens the strong shrimp flavor. These cakes make you forget that you are doing penance. 1. In a blender, purée the tomatoes with the garlic and oregano. Pour the purée into a saucepan, bring it to a boil, and then lower the heat and simmer, covered, for 20–30 minutes. Hold warm. 2. In a bowl, beat the egg yolks and then add the shrimp powder and bread crumbs and mix well. Set aside. 3. In a separate bowl, whip the egg whites until they form stiff peaks. Add the shrimp mixture and combine well. The consistency should be that of a thick batter. Add a tablespoon of water if the mixture is too thick. 4. In a skillet, add canola oil to a depth of barely 1/8 inch and heat on medium until it shimmers slightly. Spoon the batter into the oil to make 4-inch cakes. Fry them about 2 minutes on each side until they are golden and crispy. Place them on paper towels. 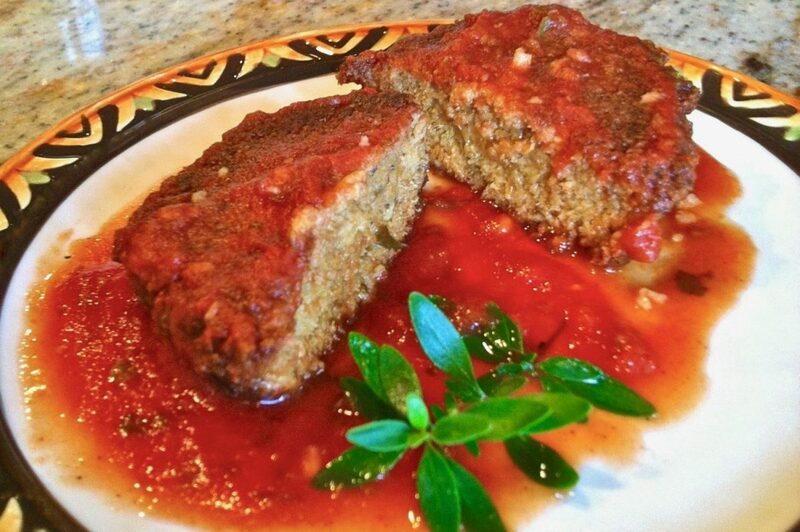 Serve two tortas de camarón on each plate and top with a generous ribbon of the tomato sauce. I suggest that you serve them with cactus, roasted or sautéed. NOTE: If you found my article helpful, I invite you to follow me on Twitter and Facebook, or subscribe below for updates (I'll email you new essays when I publish them).